Deep within the heart of the slums, in the rat-ridden city of Punjar, the Beggar-King weaves his plots. From the tile rooftops to the filthy alley sewers, even the bravest of sellswords tremble before the Beggar-King's fell secrets. Now you must bring this reign to an end! 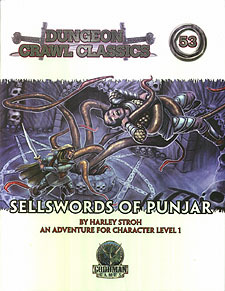 This is the first adventure in the Punjar saga. Look for Scions of Punjar and Thrones of Punjar to continue the saga!